Russian cuisine is a collection of the different cooking traditions of the Kitchen dwellers of Russia. The cuisine is diverse, with Northern and Eastern European, Caucasian, Central Asian, Siberian, and East Asian influences. Russian cuisine derives its varied character from the vast and multi-ethnic expanse of Russia. Its foundations were laid by the peasant food of the rural population in an often harsh climate, with a combination of plentiful fish, pork, poultry, caviar, mushrooms, berries, and honey. Crops of rye, wheat, barley and millet provided the ingredients for a plethora of breads, pancakes, pies, cereals, beer and vodka. Soups and stews are centered on seasonal or storable produce, fish and meats. Such food remained the staple for the vast majority of Russians well into the 20th century. Soviet cuisine had a separate character of its own. The 16th through 18th centuries brought more refined culinary techniques. It was during this time period that smoked meats and fish, pastry cooking, salads and green vegetables, chocolate, ice cream, wines, and juice were imported from abroad. At least for the urban aristocracy and provincial gentry, this opened the doors for the creative integration of these new foodstuffs with traditional Russian dishes. Russian Cuisine is in direct correspondence to the culture of Russia as a whole. Historical events such as globalization and war, for example, has affected traditional Russian recipes over time. With Christianity affecting Russia the food was divided into two types: fasting and non-fasting. This meant that almost seven months of the year were to be devoted to some type of fasting2. During this time it usually meant consuming less meat. The history of Russian cuisine dates back thousands of years. During that time Russian Cuisine had changed many times, which added new dishes and ingredients from other countries, and added many religious dishes with different meanings2. Russian cuisine history can be divided into four eras all which has shaped their cuisine today. The first era of cuisine spanned from the 9th century to the 16th century. The most common dishes served back in this time were bread, starch products, and grain-based meals. Women were the bakers for their families and usually made pancakes and rye pies. During family celebrations, pastries were served as the main dishes. 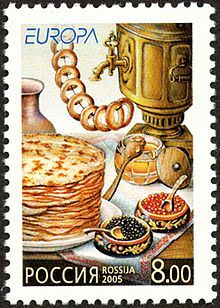 They baked Kurnik for weddings and pancakes and pies for Maslenitsa, which was also known as Shrovetide. Kasha was also made for these celebrations. It was made by boiling any type of grain in water or milk. They were worshipped in Russia as a symbol of household welfare. For example, the wedding feasts were even named after kasha. 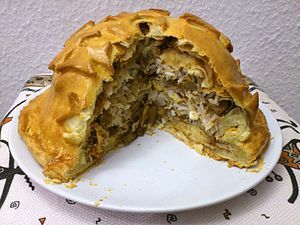 The pies made were stuffed with fish, meat, poultry, mushrooms, berries, cheese, vegetables, fruits, and sometimes kasha. When guests came over they were treated to a loaf of bread with salt. Russian Caravan was set as the centerpiece of the table at every feast. Some vegetables they ate were: turnips, cabbages, radishes, cucumbers, and peas. These were eaten raw or salted, boiled or baked, or steamed. Milk and meat at the time were not very popular due to its longevity. 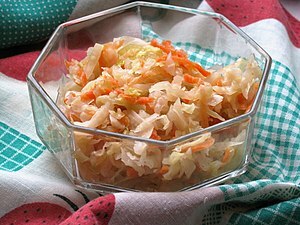 The meat was boiled in shchi, also known as cabbage soup, and had not been roasted till the later part of this era. Milk was consumed raw or baked. It was also used to make curd cheese and sour cream. Honey and berries were not only for eating at this time but also the basis for preserves, syrups, and being mixed with flour and butter or eggs. Honey and berries became the basis for Russian national dessert, being named pyranik. Most Russian beverages consisted of: mead, kvass, cider. Beer came to Russia in 1284. Meanwhile, vodka was invented in the 1440s-1470s and was made from rye grain. The beginning of the 16th to 17th century marked a time where cuisine in Russia was affected by Asian cuisine such as noodles and pelmeni which would become common in Russian cuisine. The 17th century was divided due to socioeconomic status. Russian nobility introduced foreign meals and different culinary techniques2. Corned beef and roasted ham were served for the highest class. They would also fry or stew the beef and ham. Mutton, poultry, and game were boiled and served as dishes. Russian soups in the 17th century were: solyanka, rassolnik2. These dishes consisted of lemons, brines, and olives. Delicacies such as black caviar, salted and jellied fish appeared2. Minced meat was introduced into Russian cuisine as chops, pâtés, and casserole became popular along with Swedish, German, and French soups (made from dairy and vegetables). Foreign chefs came and mixed in more diverse dishes which shaped the cuisine. The final era of Russian cuisine ranged from the 18th to 19th century. Imports from Germany, France, Italy, and the Dutch brought in different sandwiches, butter, cheeses, along with many other different dishes. The main dish was chunks of meat, the meat consisted of: lamb and pork, steaks, escalopes, and entrecôtes. Many foreign chefs also brought in potatoes and tomatoes for the side dishes. Also bringing in food mixes such as salads and garnishes which beforehand had never been seen in Russian cuisine. Soups have always played an important role in a Russian meal. The traditional staple of soups such as shchi (щи), ukha (уха́), rassolnik (рассо́льник), solyanka (соля́нка), botvinya (ботви́нья), okroshka (окро́шка), and tyurya (тю́ря) was enlarged in the 18th to 20th centuries by both European and Central Asian staples like clear soups, pureed soups, stews, and many others. Okroshka is a cold soup based on kvass or lime milk. Okroshka is also a salad. The main ingredients are two types of vegetables that can be mixed with cold boiled meat or fish in a 1:1 proportion. Thus vegetable, meat, poultry, and fish varieties of okroshka are made. Tyurya is very similar to okroshka, the main difference being that instead of vegetables, bread is soaked in kvass. It was commonly consumed during rough times such as (the Russian Revolution, World War I, World War II) and by poor peasants. Also, due to its simplicity, it was very common as a meal during religious fasting. 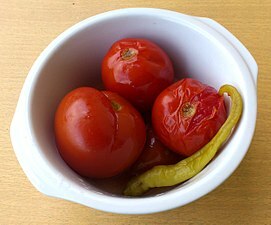 Svekolnik (also known as Kholodnik) is cold borscht. It consists of beet sour or beet juice blended with sour cream, buttermilk, soured milk, kefir or yogurt. The mixture has a distinctive orange or pink color. It is served chilled, typically over finely chopped beetroot, cucumbers, radishes and spring onion, together with halved hard-boiled eggs and sprinkled with fresh dill. Chopped veal, ham, or crawfish tails may be added as well. Shchi (cabbage soup) had been the predominant first course in Russian cuisine for over a thousand years. Although tastes have changed, it steadily made its way through several kitchen dwellers. Shchi knew no social class boundaries, and even if the rich had richer ingredients and the poor made it solely of cabbage and onions, all these "poor" and "rich" variations were cooked in the same tradition. The unique taste of this cabbage soup was from the fact that after cooking it was left to draw (stew) in a Russian stove. The "Spirit of shchi" was inseparable from a Russian izba (log hut). Many Russian proverbs are connected to this soup, such as Shchi da kasha — pishcha nasha (Russian: Щи да каша — пища наша, "Shchi and porridge are our staples"). It can be eaten regularly, and at any time of the year. Borscht is made of broth, beets, and tomatoes with various vegetables, including onions, cabbage, tomato, carrots, and celery. Russian borscht differs from Ukrainian borscht that in Russia they always use beetroot in borscht. Borscht usually includes meat, particularly beef in Russia, and pork in Ukraine. Borscht is generally served very hot, with sour cream, chopped chives or parsley, and crushed garlic. Borscht is traditionally served with black bread. Borscht is associated as national cuisine in various different Eastern European countries such as Ukraine, Poland, Belarus, Lithuania. A minimum of vegetables is added in preparation, and in classical cooking, ukha was simply a rich fish broth served to accompany fish pies (rasstegai, kuliebiaka, etc.). These days it is more often a fish soup, cooked with potatoes and other vegetables. A wide variety of freshwater fish is traditionally used. Rassolnik is a hot soup in a salty-sour cucumber base. This dish formed in Russian cuisine quite late—only in the 19th century. About this time the name rassolnik was attached to it, originating from the Russian word rassol which means "brine" (pickle water). Pickle water was known to be used as a base for soups from the 15th century at the latest. Its concentration and ratio with other liquids and soup components gave birth to different soups: solyanka, shchi, and of course rassolnik. The latest is moderately sour-salty soups on pickled cucumber base. Some are vegetarian, but more often with products like veal or beef kidneys or all poultry giblets (stomach, liver, heart, neck, feet). For best taste, there has to be a balance between the sour part and neutral absorbers (cereals, potatoes, root vegetables). Typical rassolnik is based on kidneys, brine (and pickles), vegetables and barley. Kal'ya was a very common dish first served in the 16th–17th centuries. Subsequently, it almost completely disappeared from Russian cuisine. Often it was incorrectly called "fish rassolnik". The cooking technique is mostly the same as of ukha, but to the broth were added pickled cucumbers, pickle water, lemons and lemon juice, either separately or all together. The main characteristic of kal'ya is that only fat, rich fish was used; sometimes caviar was added along with the fish. More spices are added, and the soup turns out more piquant and thicker than ukha. Formerly kal'ya was considered a festivity dish. Olivier salad (also known as Russian salad), a mayonnaise-based potato salad distinguished by its diced texture and the contrasting flavors of pickles, hard-boiled eggs, boiled carrots, boiled potatoes, meat, and peas. This dish is one of the main New Year buffets. Sel'edka pod shuboy (or Shuba, from Russian шуба, fur coat)), also known as "dressed herring", is chopped salted herring under a "coat" of shredded cooked beet, sometimes with a layer of egg or other vegetables. Very popular New Year dish. Vinegret (from French vinaigrette), a salad made of boiled beets, potatoes, carrots, pickles, onions, sauerkraut, and sometimes peas or white beans. Dressed with sunflower or olive oil. Porridge is one of the most important dishes in traditional Russian cuisine. Variety of cereals is based on a variety of local crops. In Russian, the word kasha refers to any kind of porridge. The Russian people have become skilled in different techniques for the preparation of a wide variety of whole-grain cereals. The most popular cereals are buckwheat, millet, semolina, oats, barley, and rice. These cereals are traditionally cooked in milk, especially for breakfast. People add butter, salt, sugar, different jams or fresh fruit and berries to taste. Also, simply cooked salty porridges, especially buckwheat and rice, can be served as the side dish. As a garnish to meat dishes in the past the most common were porridges and cereals, in which the meat was boiled, later on boiled or rather steamed and baked root vegetables (turnips, carrots) as well as mushrooms; additionally the meat, without taking account its type, was garnished with pickled products—pickled cabbage, or sour and "soaked" (marinated) apples (mochoniye yabloki) or cranberries. Pan juices, alone or mixed with sour cream or melted butter, were used as gravy to pour on garnishing vegetables and porridges. Meat sauces, i.e. gravies based on flour, butter, eggs and milk, are not common for traditional Russian cuisine. Pelmeni are a traditional Eastern European (mainly Russian) dish usually made with minced meat filling, wrapped in thin dough (made out of flour and eggs, sometimes with milk or water added). For filling, pork, lamb, beef, or any other kind of meat can be used; mixing several kinds is popular. The traditional Ural recipe requires the filling be made with 45% of beef, 35% of lamb, and 20% of pork. Traditionally, various spices, such as pepper, onions, and garlic, are mixed into the filling. Russians seem to have learned to make pelmeni from Finnic and Tatar peoples of the Taiga, the Urals and Siberia. The word means "ear-shaped bread" in Finnic languages such as Udmurt and Komi. In Siberia they were made in large quantities and stored safely frozen outside for several winter months. In mainland Russia, the term "Siberian Pel'meni" refers to pel'meni made with a mix of meats (whether the 45/35/20 mix mentioned above or another ratio), rather than a single meat. By the late 19th century, they became a staple throughout urban European Russia. They are prepared immediately before eating by boiling in water until they float, and then 2–5 minutes more. 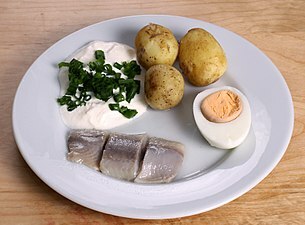 The resulting dish is served with butter or sour cream (mustard, horseradish, and vinegar are popular as well). Some recipes suggest frying pelmeni after boiling until they turn golden brown. 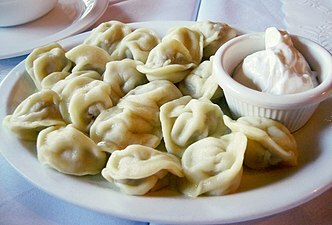 The process of making pelmeni is somewhat labor-intensive, but a device is known as "pelmennitsa" greatly speeds up the task. It consists of a typical round aluminum plate with a matrix of holes surrounded by ridges. A sheet of dough is placed over the matrix, a filling is scooped into each "cell", and the dough sags under the weight of the filling, forming the body of the dumpling. Another sheet of dough is placed on top, and a wooden roller is rolled over the top, pressing the dough layers together, cutting the dumplings apart by the ridges, and forcing the dumplings to fall through the holes. Using a pelmennitsa, the chef can quickly manufacture batches of dumplings at a time. Various minced meat dishes were adopted from other cuisines and became popular only in the nineteenth and twentieth centuries; for traditional Russian cuisine, they are not typical. Kotlety (minced cutlets, meatballs), are small pan-fried meatballs, not dissimilar from Salisbury steak and other such dishes. Made primarily from pork and beef (sometimes also from chicken or fish), they are easily made and require little time. Ground beef, pork, onions and bread are put in a bowl and mixed thoroughly until it becomes relatively consistent. Once this effect is achieved, balls are formed and then put into a hot frying pan to cook. 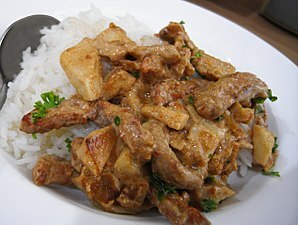 Beef Stroganoff: Sautéed pieces of beef served in a sauce with smetana (sour cream). From its origins in mid-19th-century Russia, it has become popular around the world, with considerable variation from the original recipe. Shashlyk is a form of Shish kebab (marinated meat grilled on a skewer) popular in former Soviet Union countries, notably in Georgia, Russia, Armenia, Azerbaijan, and Uzbekistan. It often features alternating slices of meat and onions. Even though the word "shashlyk" was apparently borrowed from the Crimean Tatars by the Cossacks as early as the 16th century, kebabs did not reach Moscow until the late 19th century, according to Vladimir Gilyarovsky's "Moscow and Moscovites". From then on, their popularity spread rapidly; by the 1910s they were a staple in St Petersburg restaurants and by the 1920s they were already a pervasive street food all over urban Russia. Shashlik is also used in Russia as a food to be cooked in an outdoor environment, similarly to barbecue in English-speaking countries. Kholodets (or Studen'): Jellied chopped pieces of pork or veal meat with some spices added (pepper, parsley, garlic, bay leaf) and minor amounts of vegetables (carrots, onions). The meat is boiled in large pieces for long periods of time, then chopped, boiled a few times again and finally chilled for 3–4 hours (hence the name) forming a jelly mass, though gelatin is not used because calves' feet, pigs' heads and other such offal is gelatinous enough on its own. 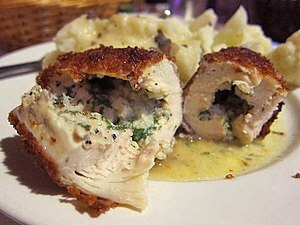 It is served with horseradish, mustard, or ground garlic with smetana. Blini are thin pancakes or crepes traditionally made with yeasted batter, although non-yeasted batter has become widespread in recent times. Blini are often served in connection with a religious rite or festival, but also constitute a common breakfast dish. The word "blin" (singular of blini) comes from Old Slavic "mlin", which means "to mill". Blini had a somewhat ritual significance for early Slavic peoples in pre-Christian times since they were a symbol of the sun, due to their round form. They were traditionally prepared at the end of the winter to honor the rebirth of the new sun during Maslenitsa (Масленица, Butter Week; also known as Pancake Week). This tradition was adopted by the Orthodox Church and is carried on to the present day, as the last week of dairy and egg products before Lent. Bliny are still often served at wakes, to commemorate the recently deceased. Blini can be made from wheat, buckwheat, or other grains, although wheat blini are most popular in Russia. 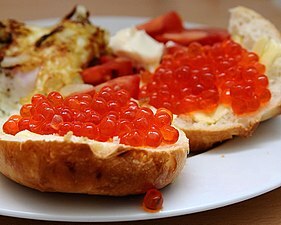 They may be topped with butter, smetana (sour cream), fruit preserves or caviar. The word "blin" is also often used as a soft curse word, expressing frustration. Syrniki are fried curd fritters, garnished with sour cream, jam, honey or applesauce. Kulich is a kind of Easter bread that is traditional in the Orthodox Christian faith and is eaten in countries like Russia, Belarus, Ukraine, Bulgaria, Romania, Georgia, Macedonia, Moldova and Serbia. Traditionally after the Easter service, the kulich, which has been put into a basket and decorated with colorful flowers, is blessed by the priest. Blessed kulich is eaten before breakfast each day. Any leftover kulich that is not blessed is eaten with Paskha for dessert. Kulich is baked in tall, cylindrical tins (like coffee or fruit juice tins). When cooled, kulich is decorated with white icing (which slightly drizzles down the sides) and colorful flowers. 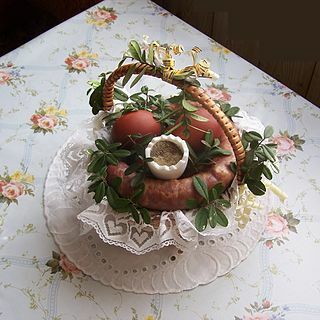 Historically, it was often served with cheese paska bearing the symbol XB (from the traditional Easter greeting of Христос воскресе, "Christ is Risen"). The recipe for kulich is similar to that of Italian panettone. Paskha is a festive dish made in Eastern Orthodox countries which consists of food that is forbidden during the fast of Great Lent. It is made during Holy Week and then brought to Church on Great Saturday to be blessed after the Paschal Vigil. The name of the dish comes from Pascha, the Eastern Orthodox celebration of Easter. Cheese paskha is a traditional Easter dish made from quark (curd cheese, Russian: творог, tr. tvorog), which is white, symbolizing the purity of Christ, the Paschal Lamb, and the joy of the Resurrection. It is formed in a mould, traditionally in the shape of a truncated pyramid (a symbol of the Church; this form is also said to represent the Tomb of Christ). It is usually served as an accompaniment to a rich Easter bread called paska in Ukrainian and kulich in Russian. The pascha is decorated with traditional religious symbols, such as the "Chi Ro" motif, a three-bar cross, and the letters X and B (Cyrillic letters which stands for Христосъ Воскресе. This is the Slavonic form of the traditional Paschal greeting: "Christ is Risen!"). All of these religious decorations symbolize Christ's Passion and Resurrection. Varenye is a dessert and condiment. It is made from cooking fruits or berries. It is similar to jam except that fruits are not macerated and the consistency is more akin to fruit within syrup. It is used as a topping for crepes and syrniki and as a sweetener for tea. It is also eaten on its own as a sweet. Pastila is a fruit confectionery (pâte de fruits). It has been described as "small squares of pressed fruit paste" and "light, airy puffs with a delicate apple flavor". In Imperial Russia, the "small jellied sweetmeats" were served for tea "with a white foamy top, a bit like marshmallow, but tasting of pure fruit". Zefir ( may also be spelled zephyr or zephir) is a type of soft confectionery made by whipping fruit and berry purée (mostly apple puree) with sugar and egg whites with subsequent addition of a gelling agent like pectin, carrageenan, agar, or gelatine. It is commonly produced and sold in the countries of the former Soviet Union. The name given after the Greek god of the light west wind Zephyr symbolizes its delicate airy consistency. Zefir is somewhat similar in its consistency to marshmallows, Schokokuss or krembo. 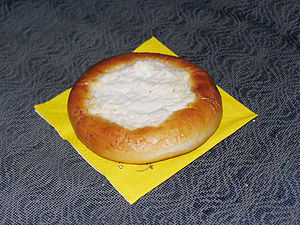 It is derived from the traditional Russian pastila but with added egg white foam and a gelling agent. The form typically resembles traditional meringue. However, in contrast to commercial meringue, it is never crisp. It is usually of white or rose color. Chocolate-coated versions are also widespread. In contrast to the other chocolate-coated marshmallow-like confectioneries they normally do not include a biscuit layer. Kissel can be served either hot or cold, also together with sweetened quark or semolina pudding. Kissel can also be served on pancakes or with ice cream. If the kissel is made using less thickening starch, it can be drunk — this is common in Russia and Ukraine. Vodka is most well-known of Russia's alcoholic products and is produced, with some variation, throughout the country. Vodka can be either grain or potato based and is frequently flavored with a great variety of ingredients ranging from hot-pepper and horseradish to fruits and berries. Beer has been manufactured in Russia since at the very least the 9th century. Its popularity was for many centuries concentrated in the Lands of Novgorod. Beer continued to be made throughout Russian history, but real growth came in the 18th century when many breweries were founded in order to supply the newly modernized and expanded the imperial army and fleet. A real explosion in the popularity of beer came in the last decades of the Soviet Era and has continued into the present day, with Russia now ranking as the fourth largest producer in the world. Wine is manufactured in the southern regions in the country but lags far behind other alcoholic beverages in popularity. The wine industry, which was somewhat notable in imperial times, is slowly expanding, but most Russians that drink wine tend to prefer imported foreign varieties, especially sweet varieties produced in the countries of the former USSR and little known in the outside world. Kvass is an ancient and still widely popular bread-based drink. The basic method of preparing kvass includes water, flour and liquid malt; these ingredients are used to make a dough that is subjected to fermentation. This results in a beverage with very low alcohol content. Commercial kvass is often around 0.5% alcohol. The fermented liquid, referred to as "zator," is diluted with water and mixed with yeast, sugar, and aromatic additives. This final mixture is allowed to brew for several days. Flavor additives may include fruit and berry juices (cherry, raspberry, lemon, etc. ), as well as ginger and mint. Sbiten, another non-alcoholic drink, is made of honey, water, fruit juices, and spices. Sbiten was once the most popular non-alcoholic beverage in the country, but in the last few centuries, it has been superseded and largely replaced by tea and coffee. Tea is by far the most common drink in almost all parts of Russia. First introduced from China in the 17th century, its popularity has since spread throughout the country. Black tea has always been the dominant variety, but after the Russian acquisition of Central Asia, awareness of and interest in green tea began to increase slowly. Today Russia remains one of the largest tea consumers in the world. Russian Caravan is perhaps the most well-known type of Russian tea around the world. Until the Sino-Soviet split, tea was mostly brought in from China. Now, Russia imports most of its tea from India and Sri Lanka, with Darjeeling being the most prized variety. Domestic cultivation exists in the southern regions of the country (mostly in Krasnodar Krai), but local supply is very limited compared to national consumption. ^ "The World Factbook". Cia.gov. Retrieved 27 December 2014. ^ Kafka (1998), p. 176. ^ Pokhlebkin (2004), p. 108. ^ "Orthodox Easter in Ukraine". Destinations.com.ua. Retrieved 2 October 2017. ^ "Kiev Kulich (Ukraine) - sweet Kiev - dessert Kiev - desserts Kiev - sweets Kiev". Globeholidays.net. Retrieved 2 October 2017. ^ Dee, Aliza. "Kulich – Russia's Classic Easter Cake", The Moscow Times, Moscow, 10 April 2015. Retrieved on 29 February, 2016. ^ Vera Broido. Daughter of Revolution: A Russian Girlhood Remembered. Constable, 1998. Page 122. ^ Darra Goldstein. A Taste of Russia: A Cookbook of Russian Hospitality. Russian Information Services, 1999. ISBN 1880100428. Page 209. ^ Christmas Around the World. Sutton Publishing, 1998. ISBN 9780750917247. Page 31. Skipetrova, Elena (2007). "Dining, Russian". Encyclopedia of Contemporary Russian Culture. Abingdon, UK: Routledge. ISBN 978-0-41-532094-8. Wikivoyage has a travel guide for Cuisine of Russia. Borscht is a sour soup common in Eastern Europe and Northern Asia. In English, the word "borscht" is most often associated with the soup's variant of Ukrainian origin, made with beetroots as one of the main ingredients, which give the dish its distinctive red color. The same name, however, is also used for a wide selection of sour-tasting soups without beetroots, such as sorrel-based green borscht, rye-based white borscht and cabbage borscht. Shchi is a Russian-style cabbage soup. When sauerkraut is used instead, the soup is called sour shchi, while soups based on sorrel, spinach, nettle, and similar plants are called green shchi. In the past, the term sour shchi was also used to refer to a drink, a variation of kvass, which was unrelated to the soup. Solyanka is a thick, spicy and sour Russian soup that is common in Russia and other states of the former Soviet Union and certain parts of the former Eastern Bloc. Okróshka is a cold soup of Russian origin and probably originated at the Volga region. Burmese cuisine includes dishes from various regions of Myanmar. The diversity of Myanmar's cuisine has also been contributed to by the myriad local ethnic minorities. The Bamars are the most dominant group, but other groups including the Karen people also have distinct cuisines. Pickling is the process of preserving or extending the lifespan of food by either anaerobic fermentation in brine or immersion in vinegar. In East Asia, vinaigrette is also used as a pickling medium. The pickling procedure typically affects the food's texture, taste and flavor. 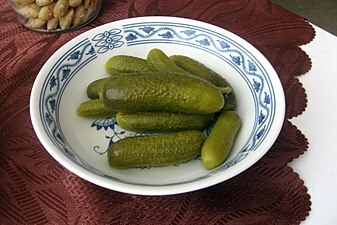 The resulting food is called a pickle, or, to prevent ambiguity, prefaced with pickled. Foods that are pickled include vegetables, fruits, meats, fish and eggs. Ukha is a clear Russian soup, made from various types of fish such as bream, wels catfish, northern pike, or even ruffe. It usually contains root vegetables, parsley root, leek, potato, bay leaf, dill, tarragon, and green parsley, and is spiced with black pepper, saffron, nutmeg, and fennel seed. Fish such as perch, tench, sheatfish, and burbot are sometimes used to add flavour to the soup. 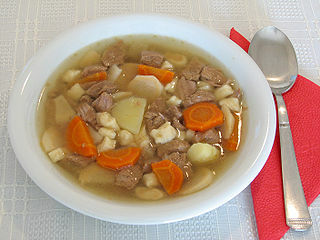 The roots of the soup originated in the culture of the Russian Cossack steppe riders and the soup is mostly associated in Russia with the Don region. Soviet cuisine, the common cuisine of the Soviet Union, was formed by the integration of the various national cuisines of the Soviet Union, in the course of the formation of the Soviet people. It is characterized by a limited number of ingredients and simplified cooking. This type of cuisine was prevalent in canteens everywhere in the Soviet Union. It became an integral part of household cuisine and was used in parallel with national dishes, particularly in large cities. Generally, Soviet cuisine was shaped by Soviet eating habits and a very limited availability of ingredients in most parts of the USSR. Most dishes were simplifications of French, Russian, and Austro-Hungarian cuisines. Caucasian cuisines, particularly Georgian cuisine, contributed as well. Canteens run by the government were called stolovaya. A common joke about Soviet cuisine made by Westerners in particular is that Soviet food simply didn't exist. Various sour soups, characterized by their sour taste, are known in various East Asian, Southeast Asian, and Slavic cuisines. Soup is a primarily liquid food, generally served warm or hot, that is made by combining ingredients of meat or vegetables with stock, or water. Hot soups are additionally characterized by boiling solid ingredients in liquids in a pot until the flavors are extracted, forming a broth. Cabbage soup may refer to any of the variety of soups based on various cabbages, or on sauerkraut and known under different names in national cuisines. Often it is a vegetable soup. It may be prepared with different ingredients. Vegetarian cabbage soup may use mushroom stock. Another variety is using a fish stock. Traditional cabbage soup is prepared using a pork stock. This is a list of vegetable soups. Vegetable soup is a common soup prepared using vegetables and leaf vegetables as primary ingredients.